Goldie Hawn parties then crawls into her limo at 4 a.m.
Goldie Hawn doesn’t let her age stop her from having a really good time. The 66-year-old actress held a fundraiser last night and stumbled out of the party just before dawn. Goldie Hawn partied hard with her daughter Kate Hudson Friday night. 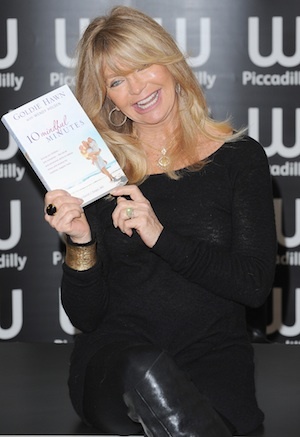 While Kate left early, Goldie Hawn stayed and continued to have fun. E! News Online reports the 66-year-old grandmother put those half her age to shame when she needed the help of her literary manager, Alan Nevins, to crawl into her limo at 4:30 a.m.
Hawn appeared very tipsy — maybe even drunk — as she left the party. Photos surfaced of Hawn giggling and having a lot of trouble getting into her car. Goldie first missed the backseat of the car and then turned around in the wrong direction. She ended up sitting against the front passenger seat with her feet on the seat while she laughed. Hawn is a Hollywood icon, known for her numerous film roles — she won an Academy Award in 1969 for Cactus Flower. She gave birth to Kate Hudson in 1979 and began a relationship with actor Kurt Russell in 1983. Russell and Hawn never married.